Note: All currencies herein are in Canadian dollars. Hexo trades on the Toronto Stock Exchange under TSE:HEXO, and there is a US ADR unit at (OTCPK:HYYDF). Hexo (OTCPK:HYYDF) is the first Canadian cannabis producer to release earnings for a period that covers the legalization of recreational cannabis on Oct. 17. Hexo’s net revenue (after excise tax) jumped 301% sequentially, and Hexo sold 952 kg of recreational cannabis in only two weeks – compared to 152 kg of medical cannabis all quarter. Hexo is not yet profitable as it is working to complete its 1,000,000 ft2 expansion and using part of its 250,000 ft2 facility for mothering plants – which reduces current production. Hexo will complete their expansion this month and will then be able to sell much more cannabis: Hexo’s Quebec supply deal is for 20,000 kg/year this year and 45,000 kg/year in two years. This suggests that Hexo will sell at least 12x more cannabis in two years than they sell today. In my view, Hexo is fairly valued based solely on the listed quantities on their Quebec supply agreement. On top of that supply deal, Hexo also has supply deals in Ontario and British Columbia – which can both generate much more revenue than they did this quarter, deals with private retailer Fire and Flower – which will pay incremental dividends soon, potential future revenue from European efforts with Qannabos, and may sell more cannabis to Quebec than the listed 20,000 kilograms. If any of these come true, shareholders may benefit. On top of that, Hexo also has a 42.5%/57.5% joint venture with Molson Coors (TAP) called Truss. They will develop cannabis-infused beverages together. Those beverages will be released when edibles are legalized in Canada in 2019. There’s little guarantee of success, but the potential market there could be enormous, especially with the marketing and distribution power of Molson Coors. That deal could also potentially lead to a buyout, although I believe Hexo is attractive even without such speculation. I rate Hexo as a strong buy, and it continues to be a core holding in my cannabis portfolio. I own shares of Hexo for two primary reasons, both of which I have covered previously on this platform. 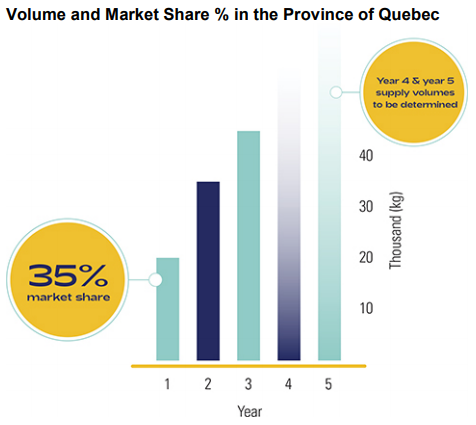 (1) Hexo has a sweetheart deal with “la belle province” (their home province of Quebec), which provides that Hexo will supply 20,000, 35,000, and then 45,000 kilograms of cannabis to the province over the next three years – and increasing from there. I have previously written extensively about this deal on this platform but suffice to say – it will provide a strong “floor” for Hexo revenue and will help ensure Hexo gets good returns from their ongoing construction. (2) Hexo has a potentially-lucrative joint venture with Molson Coors. This deal could potentially provide an enormous outlet for Hexo’s cannabis products as well as generating products in its own right. The value of this deal is speculative – they don’t have any products yet since cannabis drinks aren’t legal yet – but the potential here is enormous. However, there’s no guarantee they reach that potential or that anything significant comes from the Truss joint venture. I have previously covered this deal and its potential for Hexo. Hexo is priced attractively compared to peers and compared to its future revenue, given these two factors. This is why Hexo is one of my largest cannabis investments. On Dec. 13th, Hexo released its quarterly results for its first quarter of fiscal 2019. Hexo operated on fiscal years that end July 31st, so these results cover a quarter that ended on Oct. 31st. Notably, recreational cannabis was legalized in Canada on Oct. 17th, so these results cover the first two weeks of recreational cannabis and all of Hexo’s cannabis shipments that were made in anticipation of legalization. Thus, this is the first Canadian cannabis earnings report that includes recreational earnings. Cannabis Revenue: Last quarter, Hexo generated $1.4 million in medical cannabis revenue on 152 kilograms of cannabis sold. This quarter, Hexo generated $1.4 million in medical cannabis revenue (+2% sequentially) and also $5.2 million in recreational sales. In sum, Hexo’s gross revenue grew 374% sequentially and 506% year over year. Net revenue increased sequentially from $1.4 million to $5.7 million (+301%). Net revenue excludes excise taxes which totaled $1 million. Cannabis Sales Volume: By weight, Hexo sold 952 kg of recreational cannabis and 158 kg of medical cannabis. In total, Hexo sold 6x more cannabis in two weeks of recreational sales as an entire quarter of medical sales. Despite those sales, Quebec was still forced to shutter stores only nine days into legalization: this was not enough to meet demand. Cannabis Production: Hexo is currently growing cannabis in ~250,000 ft2 but will complete a 1,000,000 ft2 expansion by the end of the calendar year. Hexo produced over 3,550 kg of dried cannabis (~14,000 kg/year run-rate). Some of Hexo’s current production space is being used to mother plants (rather than as flowering space) to ramp up Hexo’s expansion capabilities more quickly. This is reducing current production but will increase production early next year. After Hexo’s expansion is complete, Hexo’s capacity will be 108,000 kg/year (or ~7.6x current production). Geographic distribution: Of Hexo’s $5.2 million in recreational revenue, 90% came from the province of Quebec with only 10% coming from British Columbia and Ontario. This implies that Hexo earned ~$520,000 from British Columbia and Ontario combined – suggesting a lot of untapped potential, given the poor inventory fill in both of those provinces, as discussed below. Product Mix: Hexo’s product mix during Q1/19 was 81% dried flower and 19% oral sprays. Oral sprays command a higher revenue per gram equivalent than dried flower, so would be pushing the $5.45/gram figure upwards. Given a dearth of other recreational results, we don’t know how this product mix compares to peers. Within medical cannabis, there are companies with much better mixes than this (that is, more high-margin products and less dried flower), but we don’t know if that will hold true for recreational cannabis. Two weeks of recreational cannabis sales were not enough to bring Hexo up to profitability. While Hexo’s revenue rose dramatically, Hexo was further away from profit than last quarter. Operating costs: Hexo’s operating costs rose in Q1/19, up to $22 million from $11 million last quarter. Most of these increases came from increases in marketing and promotion (up $8 million) and in share-based compensation (up $2.8 million). Management attributed the marketing cost increase to the launch of adult-use marketing and promotional events – including the Hexo “Never Jaded Tour” which featured the Wu-Tang Clan and Our Lady Peace. Cash flow: Hexo posted an operating cash flow deficit of $22 million and spent $25 million on capital expenditures, as the company works to finish its 1,000,000 ft2 expansion by the end of the calendar year. Expansion costs are likely to continue next quarter but should decline once that construction has finished. Despite having $48 million in cash burn this quarter, Hexo’s cash position is not alarming. The company has $208 million in net cash (with receivables), including $172 million in cash and short-term investments. Hexo does not have any debt. Given that Hexo’s expansion will finish next quarter and that Hexo is likely to sell at least 5x as much recreational cannabis – they sold <1,000 kg this quarter and have a supply deal for 20,000 kg/year – Hexo may be cash flow positive by Q3/19 or sooner. Thus, while Hexo did file a base shelf prospectus to allow them to raise money, I don’t expect Hexo will need to raise money any time soon unless they expand through an acquisition. Hexo has supply deals with the three largest provinces in Canada (QC, ON, BC) but does not have supply deals with any other provinces. Notably, however, Hexo had poor inventory fill over the first few weeks of legalization. When Hexo’s production ramps up with the completion of their 1,000,000 ft2 greenhouse, Hexo will be able to better-fill this inventory and increase their revenue. (2) In “The Top Cannabis Brands In Canada – An Analysis Of Sales Data“, I did not mention Hexo. However, in the underlying data that I used to write the article, Hexo was 16th in Ontario cannabis sales during the relevant time period (at ~$60,000) – and sold less than 1/20th as much as the leader in sales (Redecan). This lack of sales was due to a lack of inventory: Ontario had nothing in stock at the time as that ~$60,000 in sales was the result of Ontario selling its entire inventory of Hexo products. The data on sales is limited to dried flower and is limited to a time period from a few days after legalization until a couple weeks later. 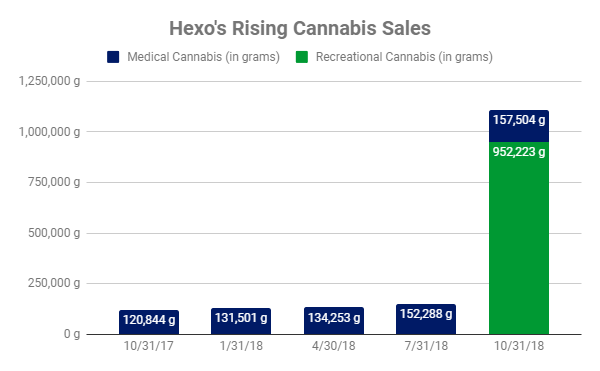 Given that Hexo sold only ~$60,000 in inventory during that time – which was everything in stock – they likely did not begin with too much more than that – perhaps $200,000 at the high end. Hexo will have a chance to increase its sales in Ontario when they begin supplying the province with more dried flower products. (3) Hexo is not yet distributing cannabis to its private retail partner, Fire & Flower. Hexo has a deal with Fire & Flower, who currently runs 12 stores in Alberta and Saskatchewan and has plans to open more. 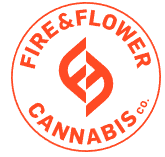 As of Dec. 13th, I was unable to find Hexo products offered for sale at Fire & Flower’s online cannabis shop (after checking two Alberta locations). Notably, this sentence implies that 100% of revenues were realized through the SQDC (QC cannabis site), OCS (Ontario Cannabis Store), and BCLDB (BC’s Liquor Distribution Branch). What does this mean? Simple: Hexo’s recreational sales are likely to rise in the future. Hexo has not filled the retail channels available to the company. There is insufficient inventory in all three official provincial websites, and there is no inventory in Fire & Flower stores. 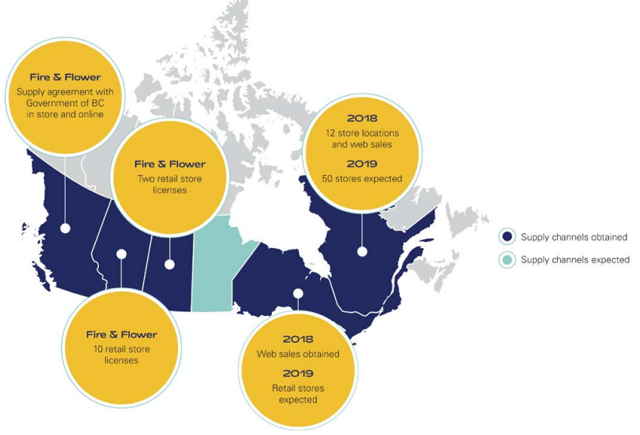 Further, each province – and Fire & Flower – is going to launch more retail stores. When Hexo’s expansion is complete – later this month – they will be able to begin filling up inventory in all of these channels, which could help to increase revenue to at least $30 million/quarter (assuming 5,000 kg/quarter from Quebec and 1,000 kg/quarter elsewhere). Will Quebec Need Additional Cannabis? “Under the agreement, Hydropothecary will supply 20,000 kg of products in the first year of the agreement and is expected to supply 35,000 kg in the second year and 45,000 kg in the third. The volumes for the final two years of the agreement will be established at a later date based on the sales generated in the first three years. The supply arrangement covers the full range of the Company’s products and brands, from flowers to cannabis oil. My suggestion looks to be correct based on early data. Recreational cannabis was legalized in Canada on Oct. 17th. CBC reported Quebec cannabis stores were shutting down three days/week due to lack of supply on Oct. 26th. During the quarter ending Oct. 31st, Hexo sold 952 kilograms of recreational cannabis and 90% was to Quebec. This suggests that Hexo sold ~850 kg to Quebec and Quebec ran out of cannabis within 9 days. If we work some quick math, 850 kg in nine days is ~94 kg/day or ~34,500 kg/year – and 850 kg wasn’t enough to keep stores open even with a low initial store count: 12 stores at launch, up to 20 this year, 50 next year, and 100-150 within three years. Admittedly, demand in the first nine days of cannabis use was not typical levels of demand. There were lines of people waiting for legalization day when we could finally smoke legally. That caveat aside, if Hexo’s 850 kg (plus supplies from other producers) wasn’t even enough to keep stores open for nine days – Quebec might need to order additional cannabis. Who might benefit from that? Perhaps their only supplier based in Quebec – Hexo. Perhaps their largest supplier – also Hexo. Or, perhaps it will be the company they hired to run their warehouses – Hexo. Others are also likely to benefit, but if Quebec needs more cannabis, Hexo appears to be the most likely company for Quebec to turn to. All cannabis companies are risky investments. Hexo is a risky investment. Share prices will be volatile – we may see large swings. Investors should be prepared for that, and size their investments accordingly. In the distant future, I expect cannabis stocks to be consumer-defensive stocks – it is a staple good that users will consume whether or not the economy is booming. Today, however, we aren’t there yet. These shares will be volatile. This quarter, Hexo earned gross revenue of $6.6 million and net revenue of $5.7 million. Annualized, Hexo trades at ~38x net sales. Most companies that trade at these values will be volatile. While I expect Hexo’s revenues to rise quickly over the next few years – my Hexo revenue forecast model suggests ~$220 million in revenue in 2020 – Hexo’s revenue today is tiny and unlikely to provide much support for current share prices. Like all cannabis companies, there are a lot of execution risks here. Hexo’s marketing efforts could fail and their products may struggle. Hexo’s European efforts might never yield revenue. Truss could be a dud. Hexo could suffer crop loss. Short-sellers could raise allegations that hurt share prices. Hexo could have to withdraw products due to mold. In short, all sorts of calamities could happen here. I advise all investors to be cautious in cannabis investments. Be aware of the speculative nature of these investments and the potential for volatility and for the loss of principal. Please invest responsibly and size your investments in light of the risks of these investments. As a cannabis industry observer, I found Hexo’s earnings fascinating. This is our first look at post-legalization earnings in cannabis. We found out that in two weeks, recreational cannabis sales could be 7x as high as medical sales for the entire quarter. We confirmed that Aurora’s (OTC:ACB) $5.50/gram figure was accurate (see my coverage of Aurora for details), as Hexo earned a similar $5.45/gram. As for Hexo, this was a good quarter. Hexo grew 3,550 kg of cannabis and is set to complete its expansion this month. That will allow Hexo to grow 27,000 kg/quarter of cannabis. Hexo’s revenue increased 4x with only two weeks of recreational sales. 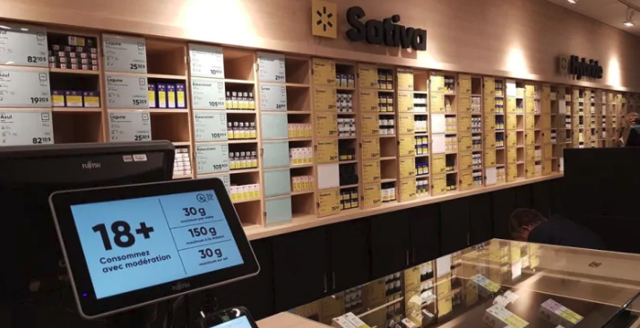 That is despite the fact that Hexo’s recreational volume wasn’t enough to even keep stores open in its home province, nor to supply Ontario with dried flower, nor to supply Hexo’s private retail partner with cannabis. On top of that, Hexo’s joint venture with Molson Coors hasn’t even gotten underway. Despite revenue rising 4x from last quarter, Hexo still has a lot of room to grow. I rate Hexo as a strong buy. It remains a core holding of my cannabis portfolio. Daily run-downs of breaking cannabis news – including news on both U.S. and Canadian cannabis producers. Exclusive access to my in-depth research articles on smaller cannabis companies. Access all my past Seeking Alpha articles – even back-articles that are no longer free. Disclosure: I am/we are long HEXO. I wrote this article myself, and it expresses my own opinions. I am not receiving compensation for it (other than from Seeking Alpha). I have no business relationship with any company whose stock is mentioned in this article. Additional disclosure: I am long Hexo via both shares and warrants. This is an abbreviated version of my full earnings report and forward earnings estimate from The Growth Operation.